Color(s): Variance of colors that include black, cream, white, apricot, and brown; may be solid or patterned. The Lhasapoo is created by the crossing of two breeds: Lhasa Apso and Poodle. They are commonly referred to as "designer dogs" and have become popular companions. Compact, well-proportioned, and medium-sized, the Lhasapoo exhibits a sturdy appearance and large, expressive eyes. They are agile, alert, and bold. The Lhasapoo is affectionate, loving, and loyal. They are very family oriented and do not do well if ignored or left alone for extended periods of time. Boredom or loneliness will lead to destructive behavior and incessant barking. They do best in a home with older, considerate children. They do well with dogs and non-canine pets they have been raised with. Lhasapoo's are suspicious of strangers and will alert their family to visitors or out of the ordinary sounds. Depending on coat type, the Lhasapoo requires frequent brushing to remove loose and dead hair or professional clipping. It is important to regularly check and clean the ears to prevent infection. The Lhasapoo may be prone to such health issues as hip dysplasia, sensitivity to flea bites, kidney problems, PRA, epilepsy, and anemia. 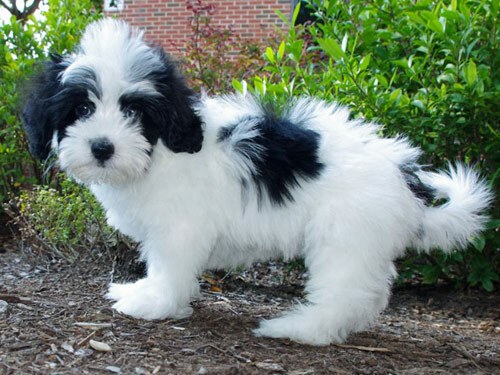 The coat of the Lhasapoo may be straight and soft, wiry and curly, or a combination of both. Early socialization and obedience are recommended. Lhasapoo's have a tendency to be noisy and may be difficult to housebreak. They will not respond to harsh or heavy-handed methods. Training must be done with firmness, fairness, reward, patience, and consistency. The Lhasapoo will do okay in an apartment provided they are sufficiently exercised and mentally stimulated. They enjoy family play sessions, securely leashed walks, and off-lead play time in a securely fenced yard.